I needed neither the fresh snowfall nor the weatherman’s enthusiastic welcoming of the Winter Solstice to remind me today that it is indeed the darkest time of year. (Or indeed the shortest day, which took on new meaning at work today, as I’m quite sure 8-1/2 hours passed in the span of about four. At least, it seemed that way =D.) It is generally still dark enough–and gloomy–when I go into work that headlights are required, and always dark enough on the return trip home. Short days are compounded by overcast skies. Sunlight is a rare and cherished commodity. This gloom and darkness are generally less noticeable during the Holiday season–there are so many lights and other decorations, that the world somehow stays cheery through the New Year, until at last January arrives and winter hits full force. That is, the darkness is less noticeable unless you are trying to take pictures, especially indoors, without resorting to electronic flash or other lights. That is to say, plenty of knitting, no photographic proof! Either I haven’t been home during daylight hours to snap pics, or–worse yet–I’ve forgotten. Gulp. I did manage to get a decent picture of one project which came and left in just about a week. I kept reading about the need for scarves for the Orphan Foundation of America’s Red Scarf project, so I bought some wool and knit like crazy in an attempt to get it out by the deadline. 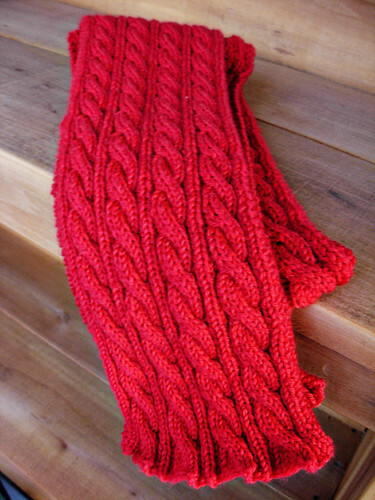 Modifications: I didn’t think the scarf was wide enough with three repeats across, so I made four. I’m not a big fan of knitting scarves–they go on forever and ever and ever. This wasn’t really an exception. Sixty inches (a requirement) is a long way. Adding cables always helps though, and I really like the pattern. If the occasion called for it, I could probably knit this pattern again, although hopefully with more time than a week to knit it in! I have other knitting waiting patiently to be shown off as well–two nearly finished projects, in fact. The good news is that I have from Christmas to New Year’s off work, (Yea!) so hopefully I will not only have two new finishes to end the year, but pictures to share as well. Here’s hoping for some sun! I second the request for sun! (Especially on days when I am home to take advantage of it.) I completely sympathize with both the lack of pictures and the forgetting to take them…if I can’t shoot when I’m ready to do it, it often gets lost in the shuffle. The scarf looks great. Sixty inches on size threes is a looong way to go in a scarf. Someone will be thrilled to get it, though. Enjoy your week off!